<- That is what your tax dollars are being used for. 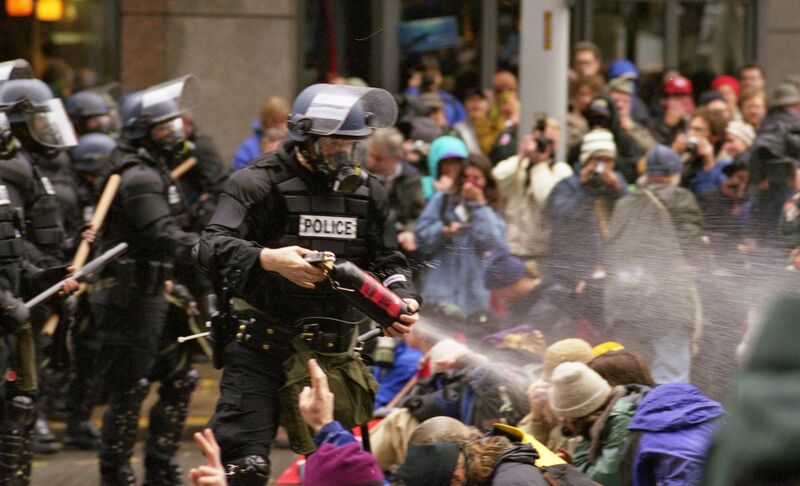 To buy the pepper spray and body armor that that officer required to spray these WTO protesters in Seattle. Before bothering to read any farther, do you agree with this statement: police forces are established to protect and serve the citizens. If you don't agree with this statement, then it's probably not worth reading any farther, although I welcome you to do so. Now, if we consider that statement correct, then we have to ask ourselves: do you want your tax dollars, and your complacency to enable such gross abuses of power? Were these protesters lighting fires, settings bombs? No. They were merely protesting somewhere that the government had decided they shouldn't be allowed to. I am reasonably sure that if you went around the country asking people, very few would say that these people were a danger to anyone. Stopping robberies and muggings, preventing shootings and perusing killers? Yes. They are a threat to everyone, including themselves. The same thing will occur over and over, unless we care to do something to break the cycle. Why are there such blatant abuses of power? Lack of accountability. No one knows who that officer was, where his orders came from, or why they were issues. The police system is about as transparent as a cinder block from the vantage point of the ordinary citizen. Deciding what to do about it is a lot more complex: after all, just adding more rules and regulations is likely just going to make it more complex and confusing. For a start, every officer should be clearly emblazoned with a number. I mean, huge, yellow lettering across their chest and back. And as short as can be managed, as well. No 17 digit I.D. tags that no one will remember. And anonymous access to a website where you can enter the number and be provided with a link to contact this person's commanding officer, along with links to resources about citizen rights. A pipe dream? Probably, but it's a least a start. We can make a difference: I'm sure that most people have seen the video of police storming a suspected drug dealer's house, shooting his dogs and arresting him.... while young children were present. And then finding nothing but a small amount of marijuana. And there have been changes made, no matter how minor they are, including a statement that presence of children may be considered a factor in whether or not an armed assault will be conducted. (Source, anyone?). They're our police. When people are as afraid of them as they are of the criminals that they should be protecting us from, the system is broken.